A common question those living with travertine, marble, limestone, slate, and granite flooring ask is, “How often should I seal my stone floors?” Of course the answer is rarely as simple as the question, so we will dig deeper on understanding the importance of sealed floors, and what factors go into the lifespan of your sealed natural stone. Why Seal My Natural Stone? Sealing your floors is a great way to help preserve your flooring materials and protect your investment, keeping your floors looking great for years to come. A seal puts a protective barrier between your floors and all outside influences that come into contact with it. This is especially important when it comes to natural stone materials such as Granite flooring, travertine flooring, limestone flooring, marble flooring, and slate flooring because these stones are porous and fragile. They have high absorbency and will take on stains from spilled liquids and damages from pushed in, impacted dirt and grime. Whenever you properly protect and preserve your natural stone flooring, it can last for decades and decades. 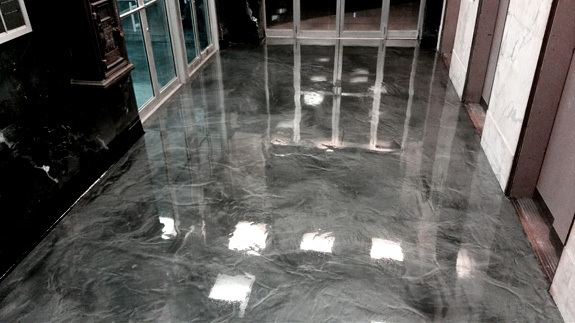 What Factors Go Into Lifespan Of Your Floor’s Seal? It is hard to give an exact estimate on how long a seal will last on your travertine, marble, limestone, granite, or marble floors. This is because there are many variables that must be taken into account. If you live in a low traffic home, clean your floors regularly, and do not have pets your seal will last longer than someone who does not perform regular maintenance on floors and has high traffic. You can test the seal on your own floors by dropping a quarter size of water onto the floors, check back periodically every hour for 4 hours. If the water leaves a wet spot in your stone you need to have them resealed, if it stays a droplet on the surface your seal is still strong. https://www.restoreyourfloors.net/wp-content/uploads/2018/05/How-Often-Should-I-Seal-My-Stone-Floors.jpg 323 575 How Often Should I Seal My Stone Floors?